The six-man Ice Team for The Coldest Journey will be confronting amongst the most inhospitable conditions on the planet, operating in near permanent darkness and enduring temperatures as low as -90°C. Below is an overview of the conditions and terrain they can expect to experience during the six-month traverse according to the different stages of the expedition. Climatically the environment is relatively warm with an average temperature of -11.74°C, and windy due to its coastal location with the average wind speed for this time of year being 16.66ms-1. It is also fairly flat. At Novo, weather during February and March is characterized by decreasing air temperature and humidity and increasing cloudiness. Winds become stronger and precipitation amounts are small. The atmospheric pressure decreases slightly, but remains high. 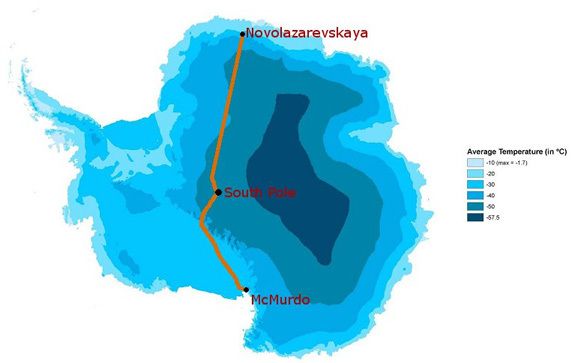 The Ice Team will travel across the relatively flat polar plateau, which averages 2,160m in thickness. The climate is extremely cold with average temperature at around -48°C for this time of year, with minimum temperatures dropping around -90°C. It is also arid, but average wind speed is quite calm (9.99 ms-1) in comparison with coastal environments. The high elevation and gradual slope of this environment and characteristic anti-cyclonic conditions give rise to persistent and predictable wind. The average wind speed at the South Pole is typically less than 6ms-1, with peak winds rarely over 10ms-1, and a predominant wind direction of approximately 40°E longitude. Winds that flow down the surface of the ice sheet toward the coast (katabatic winds) commonly reach speeds of 35ms-1, and maximum measured wind speeds have exceeded 80ms-1. On the polar plateau, temperature is controlled by solar input, latitude and altitude. For most of the winter there is no sunlight at all. The high altitude and remoteness from the warming effects of the ocean also make temperatures colder. Snowfall is light due to the distance from the ocean. This environment includes the Geographic South Pole. Further temperature information for the South Pole is given below. Based on a 32 year data series. The mean annual temperature at the South Pole is -49.3°C, and ranges from a minimum of -80.6°C to a maximum of -13.6°C. Winter temperatures drop quickly and then level out. The Transantarctic Mountains are approximately 3,000 km long, dividing West Antarctica and East Antarctica. The glacier-covered peaks ascend above the western shore of McMurdo Sound and the Ross Sea. Several large valley glaciers flow from the Polar Plateau through gaps in the range, into Ross Ice Shelf or McMurdo Sound. At the boundary of the Ross Ice Shelf and the Leverett Glacier (85.63°S; 147.58°E), there is a shear zone. The route follows the glacier up onto the Antarctic Plateau climbing at a rate of around 10% over the 80km glacier. The prevailing wind is downslope katabatic (gravity driven) following the glacier in a north-westerly direction. The conditions for the Antarctic ice shelf environment will come as a relief for the expedition team as they approach the end of their traverse, with a slope that is the flattest on the Antarctic continent and temperatures and wind speeds are moderate compared to other parts of the continent (average -22°C and 11.7 ms-1 respectively). 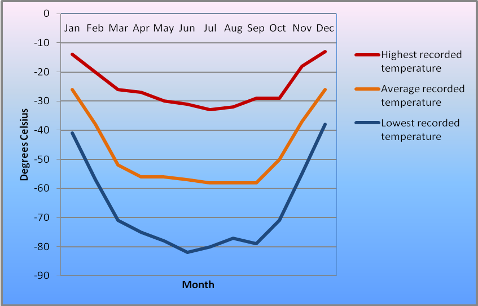 Figure 2 shows a summary of the average temperature in Antarctica with coldest temperatures in the high interior and warmer temperatures in coastal areas. 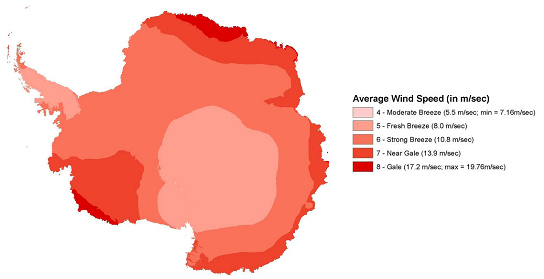 The map below shows average monthly wind speeds in Antarctica, where coastal areas experience the strongest winds. Figure 4 shows the amount of isolation (Wm-2) during the period of the expedition – there will only be a small amount of light during the first and final months of the traverse. The rest will be in complete darkness.